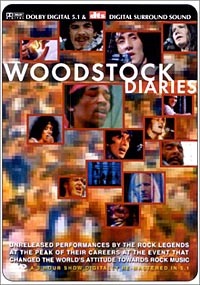 while simultaneously supplementing it with the Woodstock Diaries dvd, again. Man, I was really born in the wrong decade. You should try doing this though, you get to appreciate the dvd more after hearing insider stories from the people who were actually present during the event. I love this outfit. Your clogs are amazing and I'm desperately looking for a nice pair of wide leg jeans like yours. 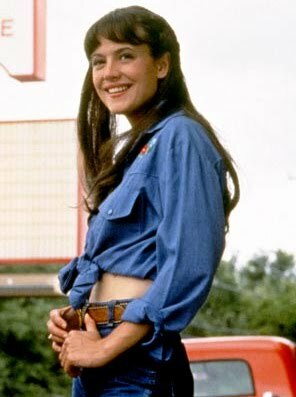 You actually look right out of the 70s! Wish I could be a bit taller......so that I could wear flared denims too! 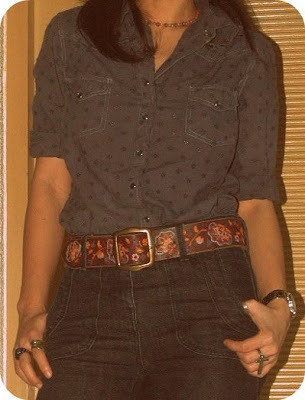 That belt is fab! And you rock those wide-leg jeans. 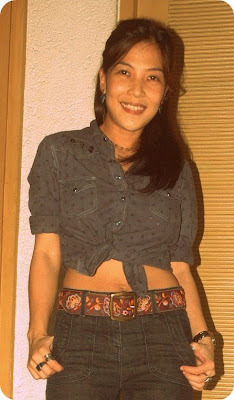 Really love your hippie style, miss eggplant. Too bad I threw away my bell bottom jeans in high school but i don't think it would still fit me. Thanks for sharing the book titles you've been reading. I might add those on my wish list. i love that you dyed your top! 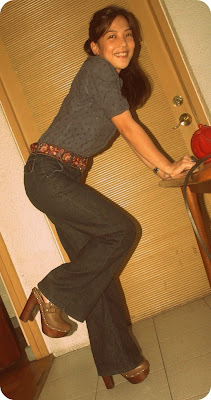 love the flared jeans...so 70s! i wear mine all the time. I really love this, cool! !